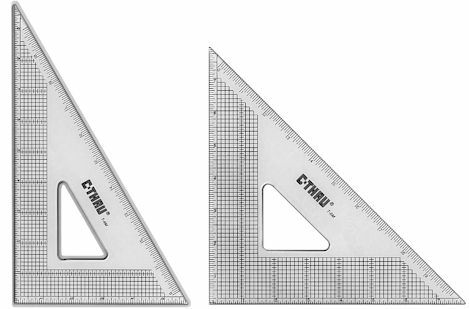 This popular series of transparent acrylic triangles are beveled on the hypotenuse and the base while the vertical side is edged with stainless steel for use with cutting tools. All edges of the triangle have graduations with inches in16ths and the vertical side and base have a grid with inches in 8ths. This series is made of 080" thick transparent gray acrylic. All the edges are beveled for smudge less inking. 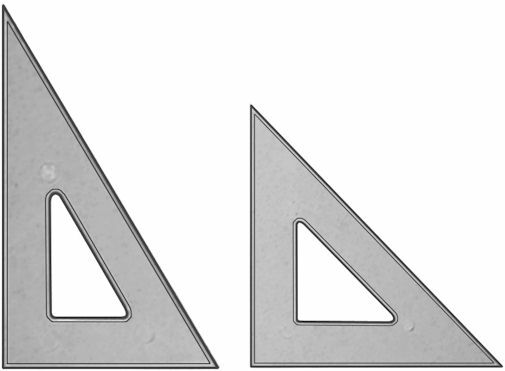 The centers of these triangles are cut out and have beveled finger lifts. The P390 series are 30°/60°/90°, the P450 are 45°/45°/90°.